A HOST OF treasures from the iconic nightspots of the Celtic Tiger era – Howl at the Moon and the Residence Club – are to be sold in Ireland’s largest-ever interiors auction next month. The sale at The Heritage Hotel, Laois, on 5 and 6 March will also feature a host of documentation from Clerys, including the original cheques from the sale of shares in the historic department store building. 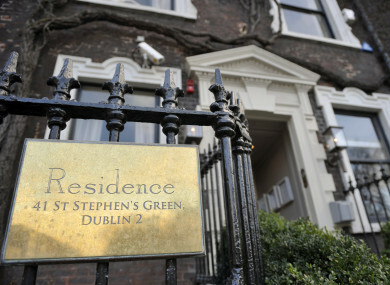 The 3,000-piece auction includes the entire contents of the exclusive Residence private members club on St Stephen’s Green – bars, mirrors, glassware and every item of their classic-styled furniture – along with refurbished furniture from the iconic Shelbourne Hotel. Also on sale will be the giant chandeliers and Game of Thrones-style bronze doors from Dublin’s Howl at the Moon nightclub. The stock is being sold by Cavan’s Victor Mee Actions Ltd in partnership with Niall Mullen. “The Clerys collection is of immense interest, as along with Denis Guiney’s original £241,000 cheque to purchase the entire share capital of Cleary and Company in 1941, it includes old photographs, office journals and store record book going back 150 years,” Mullen said. On the quirky side of items up for auction is a restored original Irish phone box from Westmeath, along with over 200 items of Irish folk and pub memorabilia. Viewings of the interiors sale take place in the Golf Course of the Heritage Hotel, Killenard on 2 to 4 March, from 2pm to 6pm each day. The auction itself takes place on 5 and 6 March. “Everything must go and there is no reserve,” Mullen said. The full catalogue of lots can be viewed in advance online here. Email “Items from Clerys, Shelbourne Hotel and iconic Celtic Tiger nightclubs going under the hammer”. Feedback on “Items from Clerys, Shelbourne Hotel and iconic Celtic Tiger nightclubs going under the hammer”.